There is a mandatory 10 minute rest/break at the pool each hour on the hour for everyone under 16 years of age. The pool is reserved for Adult Swim (16 years and older) from 3:00 to 3:30 each day – except for weekdays when the pool opens at 3:00 pm. All those under 16 must vacate the pool for that 30 minute period. From May through July our swim team practices 4:00-6:30 pm in the lap lane area, but one lap lane and other areas of the pool are open to the general membership. Only children age five and under may use the BABY POOL, and a parent must accompany them. Breaks do not apply to the Baby Pool. Lap lanes are to be used by lap swimmers only. Children who are serious swimmers may also use the lap lanes. Lap lanes may be used by the swim team for afternoon practice during designated times. During afternoon swim practice, a lane will be set aside for lap swimmers. Swim coaches may use a lap lane for instruction only if no one wants to swim laps in the lane. If a lane is being used by a coach and a member wants to swim laps, the member should ask the coach to vacate the lane. No standing or “hanging out” in the lap lanes. No swimming through the lap lanes to go between the deep end and 3 foot area. No throwing balls into, or squirting water over, the lap lanes. Our lap lanes are very popular and may have to be shared during busy times. Busy times generally start at the 3:00 pm break and continue until 6:30 pm. There is a 30 minute limit to using the lap lane when others are waiting. If the lanes are occupied and you want to use a lane, let the current swimmer know your intention. The current swimmer can elect to use the lane by themselves for up to 30 minutes or share the lane with you. The following suggestions are intended to make sharing lanes easier, increase your enjoyment of your swim workout, and allow more to enjoy lap swimming. If sharing a lane, look for and use the lane where others are swimming at about your speed. Be sure to let swimmers in the lane know you are joining it. When two swimmers are sharing a lane, each can use one side of the lane. If more than two swimmers are using a lane, take the circle approach to swimming, staying to right side of the black line both up and back. If you are tapped on the foot, someone may be trying to signal to pass. Stop at the wall to let faster swimmers pass. When swimming, take care not to bump other swimmers as you pass. The lifeguards will close the pool when, in their judgment, inclement weather threatens the health or safety of patrons. The pool will reopen 30 minutes after the last indication of inclement weather (thunder, lightning, etc). If the closure would result in less than 30 minutes of swimming remaining before the posted closing time (e.g. 8:00 or 9:00 pm), then the pool will close for the evening. The pool will remain open during light rainfall, but will be closed if rainfall significantly impacts pool visibility for the lifeguards. Our facility closes at the posted closing time (refer to pool operating hours). Please allow time for showers, etc. so that your family can exit the facility by the posted closing time. If your family requires additional time, please finish your swim in advance of the closing time. High Sierra Pools, Inc. will serve as our pool management company this year. 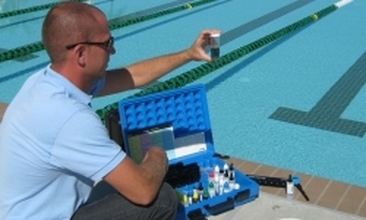 High Sierra provides lifeguards, chemicals, equipment, maintenance, etc. SAFETY is the top priority of our management company. Please do your part to look out for the safety of yourself, your children, and others, and adhere to the direction of our staff. Consumption of alcohol on club grounds is generally discouraged. However, members of legal drinking age are permitted to bring a modest amount of alcoholic beverages for personal consumption on Friday, Saturday, Sunday and Holiday evenings after 5:00 pm and during club sponsored dinners and parties. Consumption of alcohol should be handled in a discreet and responsible manner. Large coolers, glass bottles or breakable containers are not permitted on club grounds. Members are expected to carry out any alcohol related trash (containers, cans, cups, etc.). Members are also responsible for the supervision of their children while at the club. Admission to the pool and tennis courts will be denied to any intoxicated person. The possession or consumption of alcoholic beverages by anyone under 21 years of age is always PROHIBITED. This policy may be revoked at any time. The Board of Directors will regularly evaluate this alcohol policy during and after the summer season to determine if the policy should be continued, modified or rescinded.